When man-about-town Saheiji (played by the beloved comedian Frankie Sakai) finds himself unable to pay for a bill at a brothel, he is forced to remain there to work off his debt. However he finds his wit and resourcefulness enable him to turn this situation to his advantage, as he interacts with a whole range of characters, from rivalling courtesans to political activists. Voted one of the top five Japanese films ever made in a critic's poll by Japan's leading cinema publication Kinema Junpô, yet barely known in the West, Yûzô Kawashima's richly funny multi-levelled portrait of Japanese society Bakumatsu taiyô-den [A Sun-Tribe Myth from the Bakumatsu Era] is a glorious rediscovery. Co-scripted by Shôhei Imamura (Vengeance Is Mine, The Eel), it sharply and comically demonstrates the constants of human nature just as it delineates the tumultuous political times (the 1860s, leading up to the Meiji Restoration) in which they lived. 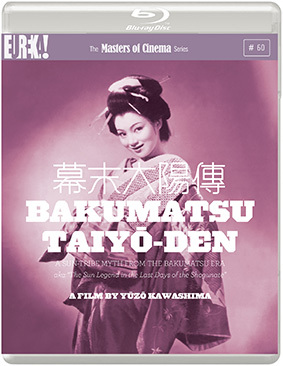 Bakumatsu taiyô-den will be released on UK Blu-ray and DVD on 22nd April 2013 by Eureka as part of the Masters of Cinema series at the RRP of £19.99 for the Blu-ray and £17.99 for the DVD. Featuring a gorgeous new Nikkatsu restoration of the film in its original aspect ratio, presented in 1080p HD on the Blu-ray and new and improved English subtitles, the release will include a booklet that will include Shôhei Imamura's tribute to Yuzo Kawashima and more, and more extra features to be announced nearer the release date (and let's face it, we know Masters of Cinema are good for it).